Hear some retrospectives and predictions around the Java skills that are in demand. 2015 is almost over. It’s time to summarize what was done and what wasn’t during the past year. Furthermore, it’s a good time to make predictions for the next year. 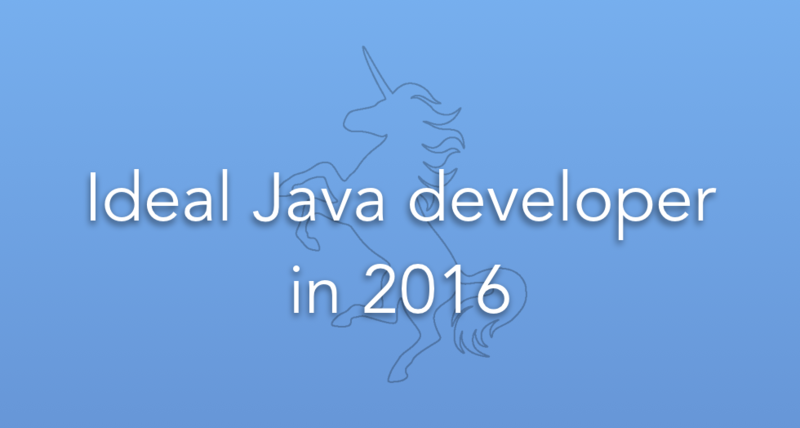 As you have already guessed, this post is about an ideal java developer in 2016. I want to surprise you, this time I changed a format of the prediction. In order to make a forecast more impersonal, I’ve invited multiple authoritative developers. So as a result you will be able to get more comprehensive opinion in order to determine what Java skills would be in demand. As you see 4 from out 5 predictions more or less have became true. Unfortunately, my 2015 prediction was pretty far from the portrait of successful Java developer, but I tried my best. What about you? Do your skills and abilities match to the portrait? 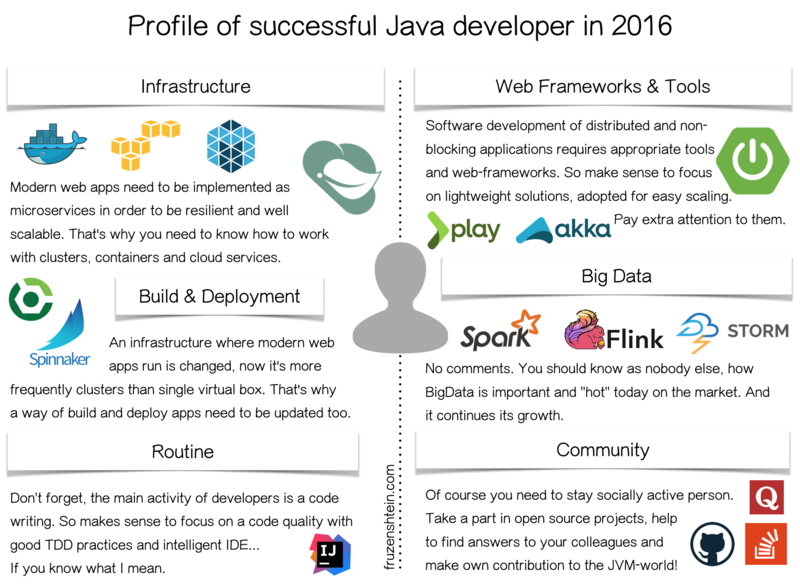 What is waiting for Java developers in 2016 and what skills will be in demand? We can make some predictions based on information and facts which we already have. The infographics below demonstrates which Java web developer skills are needed in 2016. Of course I need to explain in details what means each of topics. But if you totally agree with the infographics above, you can simply skip the rest of article and share it with your friends. Just kidding! No doubt, a back-end architecture has an influence at an infrastructure design where it should work. Microservices, microservices, microservices. A total migration from a monolithic architecture to microservices brought exciting news – we should know how to work with containerisation, clustering and new way of deployments. Everything is moving into the cloud and becoming smaller and well-grained. This is a trend. All these circumstances dictate new requirements to web-frameworks, tools and deployment process. It is extremely valuable to learn Docker, AWS, Mesos, Spring Boot, Play and AKKA in 2016. Have you ever heard these words before? This is pretty new direction of technology development. Both of them require usage of Big Data. Hence 2016 is a good time for jumping into the “Big Data Train”, because it starts a trip to high demand exactly 1 second ago. Hurry up! Spark, Flink and Storm are waiting for you. Regardless of technical progress and pressure of new trends, a developer has to do his job well. This is all about routine – a code development, refactoring and a review. In order to stay in good form and be productive, you need to use a convenient IDE, efficient engineering practices and improve programming skills. This should be considered a routine. I wish you will become a socially active developer in 2016. Because it’s a good way to learn something new and to share your experience with others. GitHub, StackOverflow and Quora will help you with this. Nobody knows what will happen in 2016, but it’s a nice idea to plan a personal activity based on facts and observations. So let’s begin the new and by the end of 2016 we will make a conclusion on what was true and what was false.